Organization is the key to getting a job done quickly in the garage, workshop, barn, or basement. When you know where all the tools and supplies are located, you spend time getting a job done and not wasting time looking for pieces and parts. Moduline Cabinets’ PROII™ series of premium garage cabinets are professionally manufactured with uncompromising quality. They are easy to install and made in the USA of a high alloy aluminum. The heavy duty, rust resistant, full cabinets are the perfect storage space. The adjustable shelves can accommodate the smaller 2-cycle oil containers and filters on one shelf, while having room for paint and primer cans on another shelf. 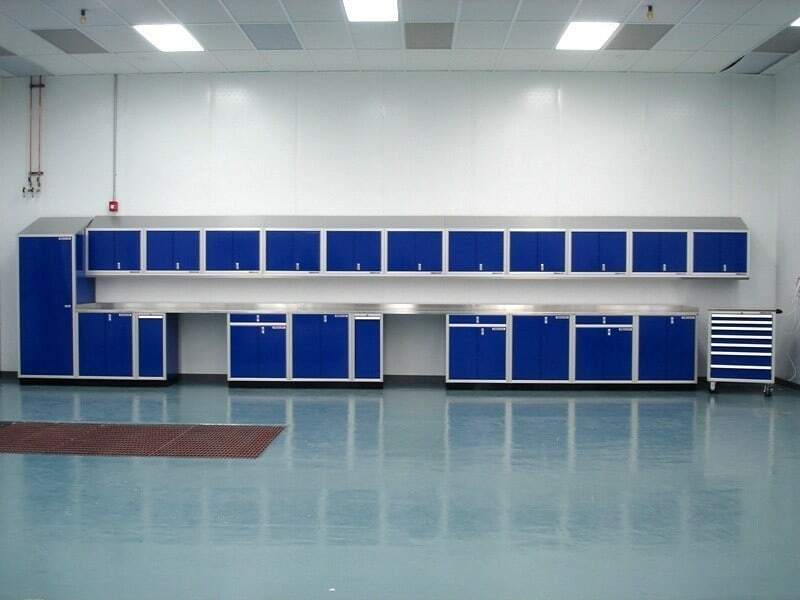 Useful in garages, shops, laboratories, and other industries, the cabinets make it easy to find items quickly. It’s also easy to see what is needed for the job, or what needs to be restocked. Base cabinets fit many of the bigger tools, kits, sets, and boxed items. They also have countertops to work on car parts or other projects. How many socket sets or specialty tool kits does every garage have? Keep everything organized in a cabinet or Tool Box. The installation of cabinets is easy and they’re available with one or two doors on the cabinet. The Aluminum Mobile Tool Boxes are the perfect choice for those who want their tools close and may need a place to work. Expand the storage by adding wall cabinets for storing tools, barn medicines, rags, and supplies. Save money with easy to install Moduline Cabinets. Our cabinets also come with a lifetime warranty.